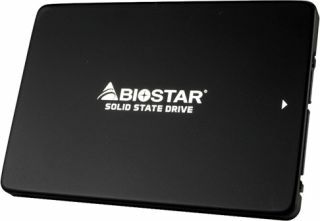 Watch out folks, here comes Biostar bursting into the solid state drive market like its 2009, waving around its first ever SSD family and touting the benefits of faster storage versus bulk capacity. Grab one of its new G300 series SSDs and enjoy faster load times for your favorite games, is basically how the pitch goes. Biostar's entering the market at a time when SATA 6Gbps-based SSD options are aplenty, and the company knows it. "With SSDs growing in popularity as the preferred storage for gaming PCs due to their faster performance, gamers are becoming more and more stringent in their buying decisions because of the large selection of SSDs in the market. All SSDs offer better performance than conventional mechanical hard disk drives but not all SSDs are the same," Biostar says. Buckle up folks, this is where the hype train gains a full head of steam. "The Biostar G300 series SSD is specifically designed for gaming 3D video content particularly VR gaming experiences. The Biostar G300 series SSD features a high-speed DDR3 cache that can provide up to twice the data transfer rate than traditional SSDs," Biostar explains. Biostar also touts rounded corners. You know, so your clumsy hands don't accidentally scrape the SSD during installation and scratch up that pristine exterior. Beyond the dubious value of rounded corners, Biostar promotes a couple of interesting tidbits, those being a six-layer coated PCB that supposedly lasts longer than conventional SSDs and four power management chips. That latter bit is a first for SSDs, Biostar says, which adds to the drive's longevity and durability. The 120GB model is priced at $44 MSRP, the 240GB at $66, and the 480GB at $140. We'll have to wait and see how street pricing shakes out, as there are several 480GB SSDs that sell for less, including ones with rounded corners.